*Welk Resorts Platinum Program* is a points-based ownership that allows for flexible vacation options at amazing year-round destinations! Guests will relish the on-site amenities, which include spectacular golf courses, tennis courts, specialty retail shops, fine restaurants, award-winning, Broadway-inspired live theater (San Diego location), close to live entertainment (Branson location), and all the amenities you'd expect from world-class resorts. For more information about a fantastic vacation, visit www.welkresort.com. *Outstanding Multi-Destination Membership* Featuring finely appointed floating accommodations. Annual usage is based on points, with 120,000 points per year included in the sale. 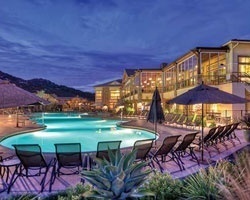 Points can be used to stay at any resort in the Welk Resorts Platinum Program. For more information or to make an offer, please submit the inquiry form.